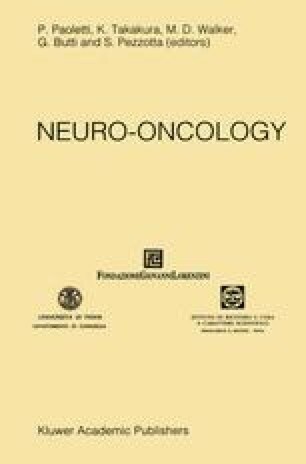 Between 1987–1990 a series of 43 consecutive patients with inoperable brain tumors, either recurrent malignant gliomas (26 cases) or intracranial metastases (17 cases) have been treated with oral methylprednisolone megadose in our department, for a total amount of 35 evaluable (1 completed cycle) cases: 22 recurrent gliomas and 13 metastases. Eligibility criteria included a Karnofsky score over 40, age over 18, no further indications for surgery or radiation therapy. Pre-treatment grading was based upon a neurological, radiological (CT scan) and performance score. Oral methylprednisolone megadose schedule ( 1 cycle: 300 mg/sq.m. p.o./alt. days q 10–12 wks) was immediately withdrawn if non-tolerated or suspended after 1 cycle if ineffective. Each single cycle was routinely followed by a day-hospital re-grading with laboratory controls. Even though a long-term follow-up is still under evaluation, preliminary results indicate an improved quality of life, with no steroid-dependency and a dramatic decrease in gastro-enteric side-effects. Actuarial survival rates show a slight increase, statistically non-significant.